Being an astronaut is a tremendous commitment. Astronaut candidates — who tend to be selected in their 30s and 40s — usually leave prestigious careers for a chance at being an astronaut, starting again at the bottom of the rung. Training means long days at work and lots of travel. There’s also no guarantee they’ll make it into space. 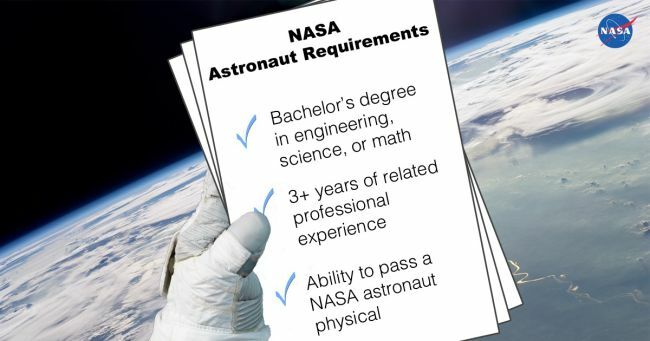 NASA’s list of minimum requirements for being an astronaut includes holding a bachelor’s degree and passing a physical. But only the 120 most highly-qualified applicants were invited to interview in 2016 (out of a record-breaking 18,300 applications! ), so one has to wonder what “soft skills” an applicant needs in order to rise to the top. While we can’t guarantee you’ll end up on the first manned mission to Mars, we’ve put together some tips to get you started. In this photo: These are the basic requirements for being a NASA astronaut, but selected candidates usually have much more experience. NASA has strict requirements for being an astronaut. The job not only needs you in top physical shape, but it also demands the technical skills to take on difficult jobs in a spacecraft or on a space station far from home. NASA has selected 22 “classes” of astronauts since the first group of seven astronauts in 1959 who were chosen for the Mercury program. The space program has grown and changed significantly since that time. The first few classes of astronauts were drawn largely from the military, especially test pilots — a group deemed ready to deal with the extreme dangers of space. But as NASA’s program evolved, more diverse skill sets were needed. The new astronaut class has a large variety of vehicles to look forward to. Astronauts today use the Russian Soyuz spacecraft to reach the International Space Station, the main destination to test out long-duration spaceflight. In the coming years, however, NASA hopes to again move beyond low-Earth orbit for missions to the moon and Mars. If this comes to pass, the new class of astronauts will use the Orion spacecraft for deep-space exploration. The new astronauts can also look forward to launching from American soil, once the new class of commercial vehicles is ready. Both SpaceX and Boeing are creating spacecraft for NASA’s commercial crew program, which is expected to get going in earnest by the end of the decade. It will be the first time Americans launch from the United States since the space shuttle program, which completed in 2011. 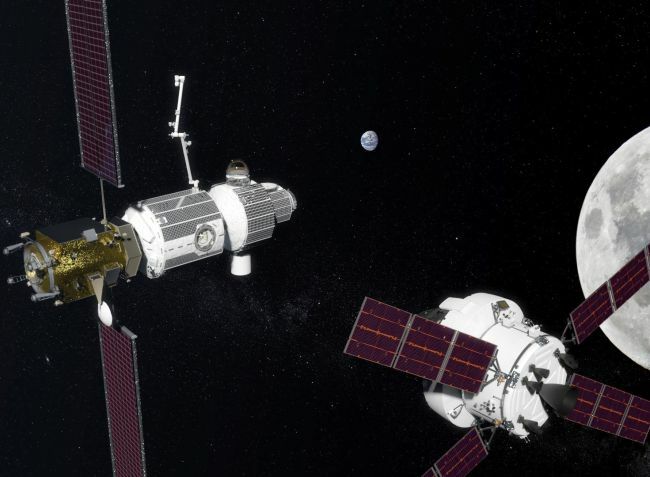 In this photo: An artist’s conception of the “deep-space gateway” space station that could be used near the moon in the coming years. The new astronauts may begin their careers traveling to the International Space Station, or they may find themselves flying farther. It all depends on where United States space policy goes in the coming years, and what programs NASA finds itself involved in. 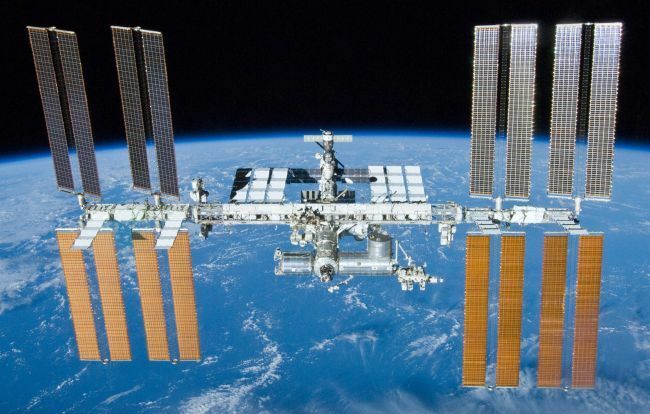 The space station is scheduled to last until 2024, but could be extended until 2028 or even longer. Other plans are more nebulous, but NASA has several ideas in mind. The agency is testing its Orion spacecraft, which is expected to make an uncrewed flight past the moon in 2019. (The agency considered putting astronauts on board, but decided not to due to the additional technical burden.) Orion would then carry humans to deep-space destinations in the 2020s and beyond. Where next? NASA hopes to bring astronauts to Mars in the 2030s, if its current plan has support for that long. As a part of that, the agency recently announced a “deep-space gateway” space station near the moon that could help the astronauts train for deep-space missions, or prepare for a voyage to Mars. In this photo: 2013 astronaut class member Anne McClain serves as CapCom (capsule communicator) with the International Space Station. This role has an astronaut on the ground communicating directly with the astronauts on the space station, relaying instructions from the rest of Mission Control. While the public mostly pays attention to astronauts while they’re in space, in reality the astronauts will spend only a fraction of their careers up high. Most of their time will be spent training and supporting other missions. First, the astronaut candidates will have about two years of basic training, where they will learn survival training, language, technical skills and other things they need to be an astronaut. 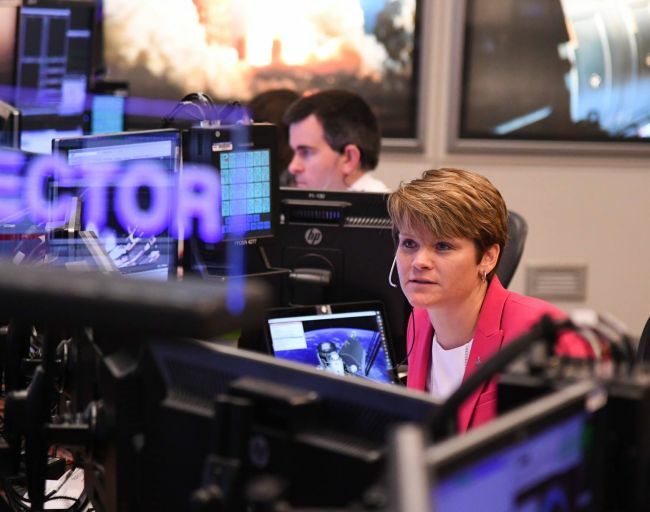 Upon graduating, new astronauts can be assigned to a space mission, or assigned to technical roles in the Astronaut Office at the Johnson Space Center in Houston. These roles can include supporting current missions or advising NASA engineers on how to develop future spacecraft. 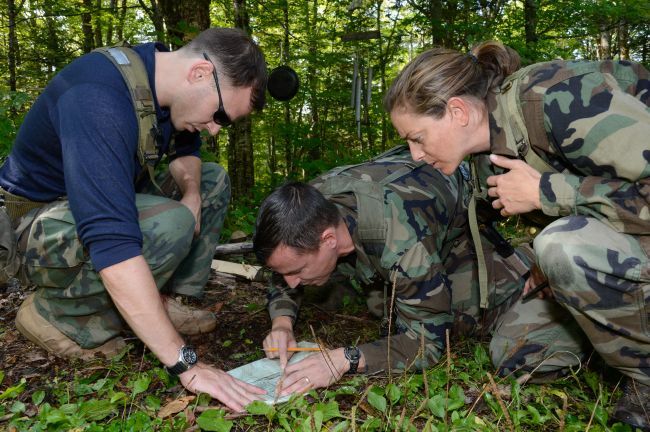 In this photo: Members of the 2013 astronaut class engage in land-survival training. 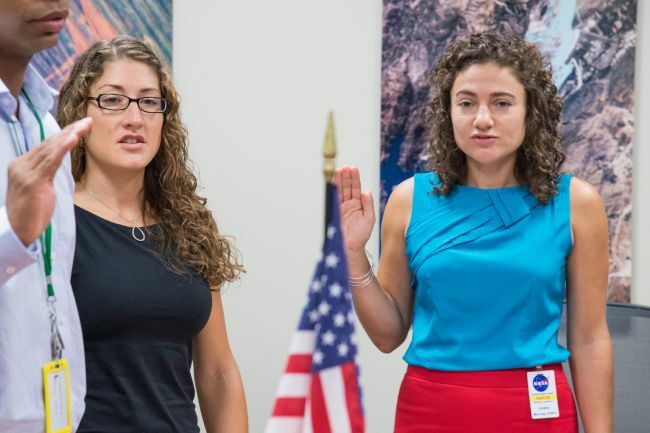 Astronaut candidates undergo an intense process before the newly selected class is certified as astronauts ready for flight. Among their many tasks will be learning how to spacewalk, how to do robotics, how to fly airplanes and how to operate on the International Space Station. The astronaut candidates will fly NASA’s fleet of T-38s to gain piloting skills; practice for spacewalks at the Johnson Space Center’s 60-foot-deep swimming pool (called the Neutral Buoyancy Laboratory); catch simulated spacecraft using a practice version of the station’s robotic arm, Canadarm2; learn Russian; and get basic training on space-station operations. Astronauts also deepen their leadership and following skills through geology and survival training. While the astronaut candidates selected by NASA will be principally working with that agency, they also will find themselves embedded in a network of international partnerships. 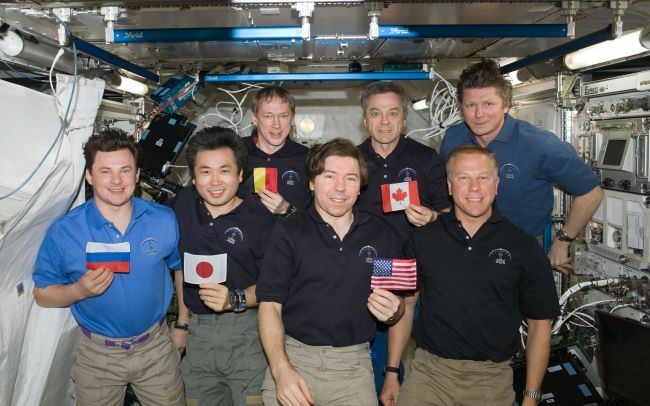 Along with commercial partners in the United States developing spaceflight hardware and the various NASA centers that work in human spaceflight, there are 16 nations participating in the International Space Station — each with its own realm of expertise. For example, Roscosmos (the Russian Federal Space Agency) operates several modules in the station and ferries astronauts to space using their Soyuz rocket. The Canadian Space Agency heavily participates in robotic operations, such as capturing cargo ships with the Canadarm2. Other major international partners include the European Space Agency (ESA) and the Japan Aerospace Exploration Agency (JAXA). Each of these agencies has its own astronauts working on the space station and in the Astronaut Office. 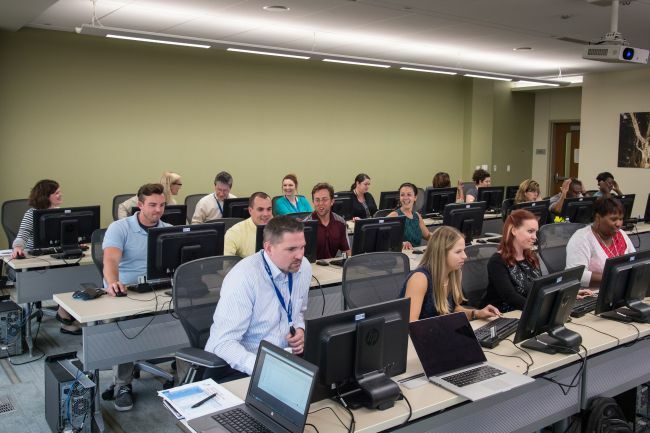 In this photo: The Astronaut Application Review Team, including members from NASA’s human resources departments, reviews applications from astronaut hopefuls. This round, a record 18,353 applications came in for just a handful of NASA spots. At first, human resources personnel reviewed each application to see if it met basic qualifications. Every application that qualified was then reviewed by a panel — the Astronaut Rating Panel. The rating panel is comprised of about 50 people, mostly current astronauts. The panel decided on a few hundred of the most highly qualified candidates, and then did reference checks on each candidate. That step narrowed down the candidates to just 120 people. A smaller group, the Astronaut Selection Board, then called in these candidates for interviews and medical screening. After that, the top 50 candidates underwent a second round of interviews and more medical screenings. The final astronaut candidates will be selected from this group of 50 people. In this photo: A flight into space is the ultimate dream for an astronaut candidate. The lucky candidates who make the cut receive a phone call from the head of the Flight Operations Directorate at NASA’s Johnson Space Center, as well as the chief of the Astronaut Office. NASA asks the candidates to share the news only with their immediate family until NASA can make an official announcement. NASA then typically holds a news conference to announce the new candidates, and invites journalists and those with social media accounts to ask questions of the new astronaut class. Then, the candidates are quickly plunged into training, giving them little time to talk with the outside world for several months at the least. The new astronaut class will start work at the Johnson Space Center in August 2017 and be sworn into civil service. There will be a few weeks between when the astronauts are selected and when they move to Houston. In that time, they will end their current jobs and arrange to move with their families to Houston. 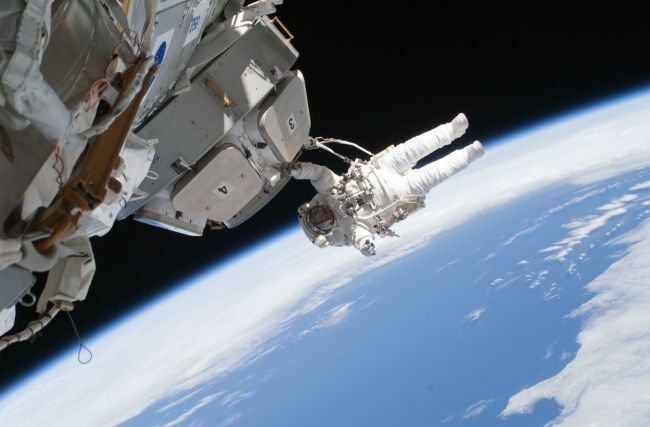 While being an astronaut is a prestigious job, candidates often leave flourishing careers to make the trip into space. However, in some cases they can use their time as astronauts to “level up” in other careers. 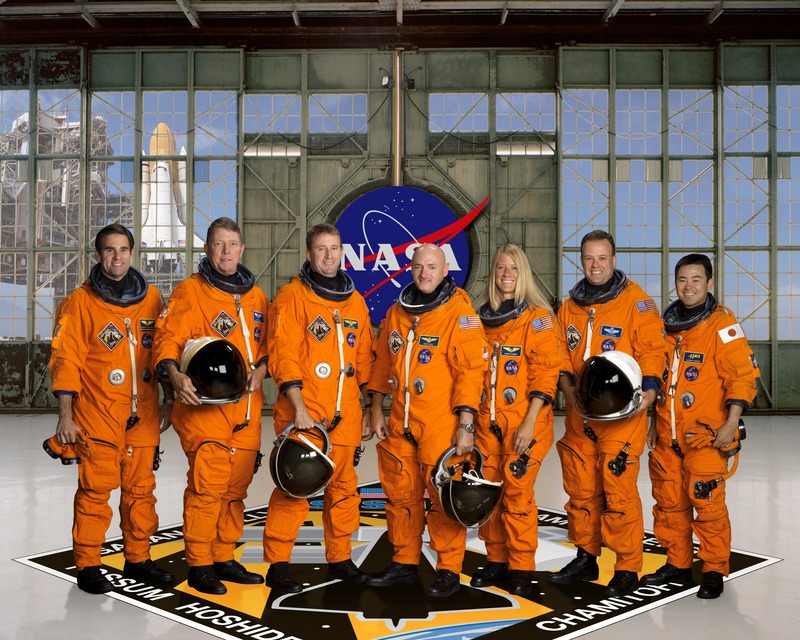 For example, military astronauts can often have a joint assignment at NASA, allowing them to keep gaining in rank while performing missions and other astronaut duties. Or those in the sciences can try to choose missions and duties related to their past careers, letting them continue to publish scientific journal papers and take on other duties that lead to advancement in academia.